March 19th is National Poultry Day. 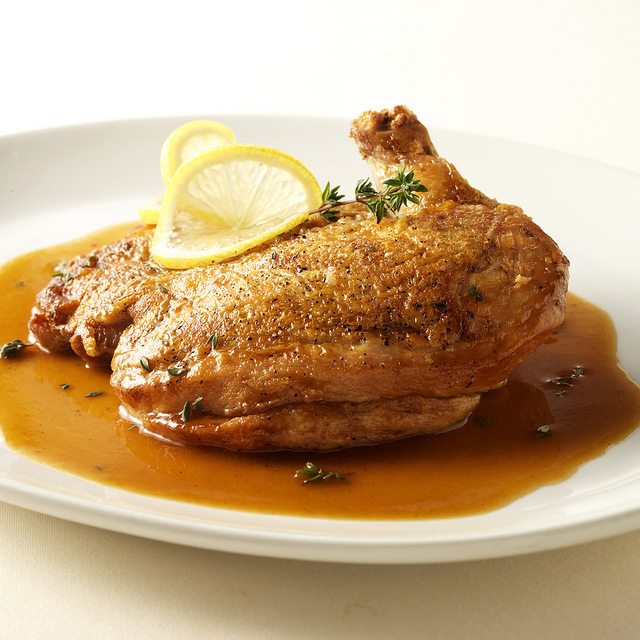 Here’s a recipe for a baked chicken dish, courtesy of Chicago’s Benny’s Chop House. The chicken is marinated in advance and cooked in the oven, resulting a chicken dish that moist and flavorful. Place chicken breast into marinade, completely submerging it for 24 hours. Preheat oven to 425 degrees. Strain ¼ cup of the marinade liquid into a large sized sauté pan and place over a medium-high heat. Remove the half chicken from the marinade, season with freshly crushed pepper and salt. Place the chicken in the pan skin side down, allowing the skin to begin to turn a medium golden brown color (about 5-6 minutes). Place a brick or large flat stone that is wrapped in aluminum foil on top of the chicken and place the pan into a 425 degree oven for 20 to 25 minutes. After cooking, carefully remove the pan from the oven then the brick from the chicken. Remove the half chicken from the pan and allow it to rest on a side plate or resting rack if you have one. Discard the excess oil from the pan and add the chicken stock. Be sure to wait for the pan to cool slightly before adding the chicken stock, the slice of lemon and the sprigs of thyme. Allow this mixture to heat to a slight boil, and then reduce to a light simmer. At the very last minute, lightly whisk in 1 tablespoon of unsalted butter to the sauce, season as needed. Pool the finished sauce in the center of plate and then place the half chicken onto the sauce. Garnish with the fresh lemon zest or slice and thyme sprigs. And if you’re in the Chicago area, stop by Benny’s Chop House to try to original “Under the Brick” Chicken dish. Benny’s Chop House is located at 444 N. Wabash Ave, in Chicago, IL.